Not much has happened since my last post, a week ago. That’s a good thing. I still feel totally normal, which is great. No issues at all with the hormones. Calcium is still normal, so I’ll be off that totally in another week. I got all the bandages off my incision, and I actually think it looks pretty decent, for being just two weeks old. One of my friends just saw me the other day and she said: “It looks like someone tried to kill you!” I was all happy that it didn’t look as bad as I thought. I don’t know what she was expecting, after just two weeks. Anyway, saw Dr. W today and he told me it looked good, and in a month I may not be able to see anything at all. He did the cutting in a good place, too. The incision is just under the neckline of a T-shirt, so you can’t even see it unless I’m wearing a collared shirt with the top button undone and no T-shirt underneath. Not much else going on, to be honest. I’m still waiting to hear the exact date that I’ll be starting my RAI treatment. Once I have that, I’ll be able to count backwards two weeks to see when I’m starting my low-iodine diet. Today’s issue is trying to figure out how I’m going to take all these pills at the right times. There aren’t enough hours in the day. So I’m supposed to take the Cytomel as close to 12 hours apart as possible. Also supposed to take it on an empty stomach both times. Also not supposed to take it within four hours of taking the Calcium, which I am supposed to take three times a day (for now). I’m actually not sure about the Cytomel. There is a lot of different info out there. Some people take it without food. Some take it with food. I think you just have to figure whichever works best for you and then do it the same all the time. I’ve also read that the Cytomel makes it hard to sleep, so you shouldn’t take it at night. It’s all very confusing. Hopefully I’ll be reducing (or eliminating) the Calcium soon, so that’ll make it easier. Met again with Dr. Q today, and he mapped out the whole post-surgery part of the treatment. Surprisingly, it is almost exactly what I expected, based on my reading on the web. Over the next three weeks or so, I won’t be doing anything special. I’ll be taking Cytomel, which is a slightly different hormone-replacement drug than the one I have been on since my surgery (Synthroid), and calcium. I am anticipating feeling pretty normal throughout this period. I have been feeling pretty normal on the Synthroid so far, which was encouraging to me, but Dr. Q said I’m still going off the remnants of my thyroid (ghost thyroid! ), so I can’t really judge yet how I’ll feel on the fake stuff. About three weeks from now I’m going to make two big changes that will make me a little grumpy. First, I’m going to be off the all the hormones. With no real thyroid and no fake thyroid hormones, I’ll probably go kinda hypo. (Hypothyroidism is the condition in which you are deficient in thyroid hormones.) I am guessing I’ll be pretty fatigued and possibly moody and maybe some other stuff. Adding to my unhappiness is that I’ll be on a low-iodine diet, which means pretty much just fruits and vegetables and small amounts of meat. I just realized alcohol is fine, though, so maybe I should just drink all day long. The big event from today was a follow-up appointment with Dr. W. He had already told me how well the surgery went when we talked the morning after the procedure, but today was my first chance to talk to him since he got the full pathology report on the stuff they pulled out of my neck. Turns out I had three small cancer spots on my thryoid, as well as some cancerous lymph nodes. Although I’d have rather heard that there was almost no cancer in there, he was telling me about cancer in tissue that is no longer inside me. So, that’s good. When I asked him flat-out if that extra, unsuspected cancer, gave any more reason for concern, he said no. So that’s what I’m still banking on. Biggest problem I’m having now is it’s uncomfortable to move around too much because of the various equipment attached to me, but just laying around is rough too. Hard to find just the right way to lay or sit without getting stiff. I did manage to sleep pretty well last night, which was a welcome surprise. Hopefully I can get the pillows just so again tonight. By tomorrow that’ll be over. I’ll get all this stuff off me and I’ll be able to move freely. My throat isn’t as sore as I thought it would be. 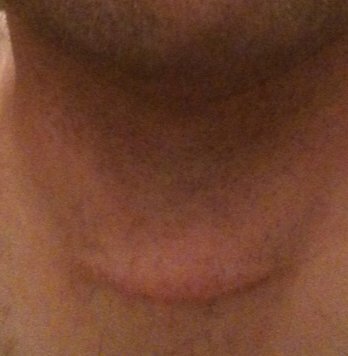 I do have a feeling like there’s something stuck in my throat, which I understand is a common thing after this surgery. Guess it’s from the tube they put in there during the surgery. I should be eating normally in a few days. I’ve got to eat while I can, because I’m anticipating at least a couple weeks of a low-iodine diet before my radiation treatment. (No processed foods. No sugar. No dairy. No fish or seafood. Pretty much just plain fruits and vegetables and small servings of plain meat.) I think that’s about 3 weeks away. I’m also bored. Fortunately I’ve got the MLB network. I watched the Pirates preview three times already. I’m also catching up on The Wire, and I’ve got a few movies to watch. I’ll be getting my iPad before starting the radiation quarantine. A shout out to my wife, who is doing a great job handling the kids and keeping track of all my meds. Finally back home. In some ways I’m better than I expected, and in one way, I’m worse. As for the surgery itself, I’m pretty good. I can move my neck more than I thought. It’s a little stiff, but not horrible. I’ve heard that you aren’t supposed to drive for up to a week after surgery because you can’t turn your neck, but it seems like mine will be OK in a few days. The little drain is still in there, though, which I wasn’t expecting. Looks like I have to keep it in till my follow-up appointment on Thursday. My throat is sore, but I can swallow OK. Today I’ve had applesauce and soup, but I’m guessing I’ll be good to eat anything in a few days. I’m also starting my regimen of medicines. I’m going to be on Synthroid, a synthetic hormone that will replace what my now departed thyroid was doing. As I understand it, there is often some trial and error in determining the right dosage. I’m not sure what happens if the dosage is wrong, but I believe I’ll probably be moody or depressed, maybe fatigued. I may also gain some weight if my metabolism is screwed up. Or, none of that may happen. Guess we’ll find out together. I’m also on calcium tablets four times a day. I think that’s just temporary. Now, on to my biggest problem. The anesthesia apparently did such a good job of putting my senses to sleep that my bladder still hadn’t woken up almost 24 hours later. I tried and tried and tried to pee at the hospital, but it didn’t happen. Very frustrating. So, they sent me home with some, uh, equipment (don’t click the link if you don’t want to know). So that’s it. I’m OK. I figure by Friday I should be feeling pretty good. I may even be able to go to my son’s baseball game this weekend. I’ve also been invited to a poker tournament on Saturday night, and I haven’t ruled that out entirely. We’ll see.